Kingwin Stryker STR-500 is here, the first ever 0dBA fan-less modular power supply with 80 Plus Platinum certification. Stryker is rated 92.83% efficiency at 50% load, completely meets the U.S.A. Energy Star Standard, and is the first of its kind in the world being offered to PC consumers. This unit features a fan-less design, which lets users operate their PC under a complete zero-noise environment. Kingwin has delivered a breakthrough solution to offer a perfect balance between power, efficiency, and noise. Not only has Stryker STR-500 achieved 80Plus Platinum certification, it also uses the single 12V rail design which provides enough power to your high end components, including your high end CPU and the latest multi GPUs configuration. 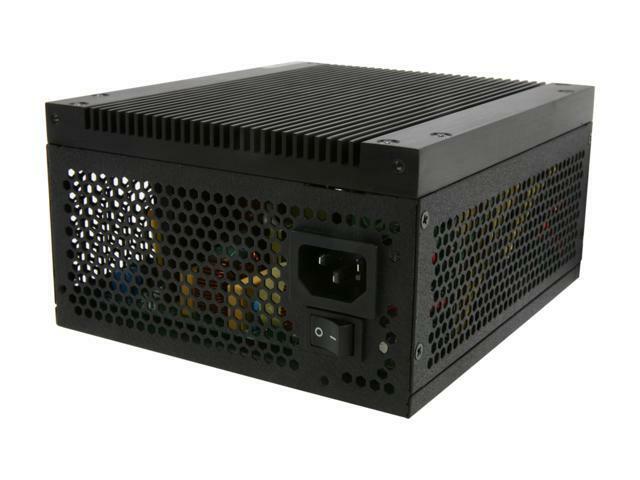 Stryker STR-500 also uses Japanese capacitor to ensure the highest quality for the power supply, solid performance for customers, and to satisfy today’s high end PC power demand. 80 PLUS Platinum Certified The 80 PLUS Platinum certified power supply provides ultra-high power efficiency of 92% at 50% load, 90% Efficiency at 20% load, 89% Efficiency at 100% load, saving your money on your electrical bill, reducing heat in your computer's system and prolonging its life. Fanless Design for 0dBA Operation The Kingwin Stryker STR-500 was designed from the ground up with thermal solution tailored specifically for fanless application, thanks to 80Plus Platinum efficiency, a large, passively cooled heatsink on the top surface and high quality components capable of operating in higher environmental temperature with longer lifetime. Overclockable Power with Single Strong +12v Rail Compliant with ATX 12V v2.2, EPS 12V v2.91, and SSI EPS 12V v2.92 Specification, the Kingwin LZP-550 is capable of delivering 500W of 80 PLUS Platinum certified continuous output. It can even be overclocked to 600W continuous at 80Plus Gold rating. A single high current +12V rail @ 41.5A design ensures the best compatibility and maximum provision of 12V power to multi-core CPUs and energy-hungry graphics cards. Easy Plug-in Modular Cable Design The cube modular connector cable design allows use of only the cables you need and easier cable routing inside the case, resulting in improved airflow and reduced system clutter. SLI/CROSSFIREX Support 2x 6 Pin and 2x 6+2 Pin PCI-E connectors are included to support SLI/CrossFireX. Japanese Capacitor High-quality Japanese capacitors provide uncompromising performance, lifespan and reliability. 6.75" x 5.88" x 3.38"
EuP(Energy-using Products) instructions: energy consumption during shut off status less than 1W. Support all intel and AMD Multi-Core CPU and its compatible Motherboards, ATX/BTX compliant. Compliance with ATX 12V v2.2, EPS 12V v2.91 and SSI EPS 12V v2.92 Specification. Passed 80 PLUS Platinum Certification, on 20% 50% 100% loading, with 90% 92% 89% Efficiency. Over Power Protection/Under Power Protection/Over Voltage Protection/ Short Circuit Protection. Support nVIDIA (SLI)/ATI, high rank & high efficiency graphic card. All series are made of RoHS unleaded green material. More than 2,000 times ON/OFF Test. Unique easy plug-in design, safe and firmly attached once connected. Unique Pending (U.S.A, Germany, Japan unique applied). High Power and Low Consumption Transformer. Other Thoughts: Not a bad idea to have good airflow going through your case to help aid in cooling this PSU. It has a heat sink, and as the heat rises, it heads directly for your CPU in you have the PSU mounted in the bottom of your case. Pros: HUGE for passive power pc builds. If you want a smoking HD video freak-station, like i have, and you don't want to hear a 747 in your living room, get this monster and be happy. I run a 4x128g SSD raid-0 in my pc so I didn't need the 800-1200w power supply that the noisy "spinner" drives require. but i do have a massive fanless video card that needed 200w of it's own - problem solved with this bad boy! Other Thoughts: supposedly has a 5 year warranty. lets see how dealing with kingwin turns out. Pros: I do not own this Kingwin Stryker STR-500, BUT, just for the info, it appears to be the same as Rosewill SilentNight-500. I own two of the Rosewill SilentNight-500 and I like them. Other Thoughts: When using a fanless PSU, always make sure all of the radiated heat from the PSU gets directly out of the computer case. The lowest cost way of doing this is to always make sure the case fan(s) blow air from outside the computer case direcrly into the case. Never, have fans "sucking" air out of the case, because, this will pull outside air into the fanless PSU and dump the heat inside ther case. I do my fanless PSU setups a little different. I always locate the PSU in a separate chamber inside the computer case. I install a super-quiet, low-volume air flow fan to blow the heat out the back. This arrangement cost more, but, it results in the quietest setup, plus, I know 100% for sure all the heat radiated from the PSU gets directly out of the case. Some may say, why buy a fanless PSU if you are going to use a fan to blow the heat outside? Answer: None of the PSUs with fans are as quiet as the fan I use, plus, fanless PSUs are better designed to conduct & radiate heat away from the internal components. Cost is not a factor with my designs, it is 100% about getting all of the heat directly out of the case with the lowest sound level. Pros: - Silent PSU. My case fans is now the loudest component of my PC. - It has connectors for two videocards. - It doesn't get hot even after many hours of usage. Though I will test it when I have time to play graphics intense games. - Probably one of the best totally silent PSU out there. - This is 80 plus certified PSU. Cons: - Kind of heacy due to large heatsink. - Price is still high, but you get what you paid for. - For that price, maybe it should come with different color LED which you can switch on or off, like Corsair Gxxx series. Other Thoughts: This PSU being totally silent with no fan at all, chances are it may need air flow coming from the PC case itself. For example, in my HAF922 I have the PSU at the bottom with 200mm intake fan cooling the hard disks and some air will also flow towards the PSU. Then I have GTX285 videocard with updated fans pointing at the PSU below. And last there is another 200mm fan on top of case for blowing out the hot air. Although even with heavy usage my system doesn't get very hot, just warm. Pros: It's running two MSI R7870 Hawk CrossfireX video cards very well. Stealthily silent and runs fairly cool, even while running BOINC at 100% stress. So far, I'm very pleased with this PSU. It provides sufficient power for the AMD FX-6300 Six-Core CPU (and two CrossfireX cards). Also running 16 Gigs of RAM. Other Thoughts: It's an excellent addition to my fanless computer!